Thousands of years ago there was born a man who would show the people the path to peace and happiness and found a religion that places love and humanity above all else. Buddha Purnima commemorates the birth of this great spiritual leader we all know as Lord Buddha and TheHolidaySpot aims to mark this beautiful occassion with a thematic word puzzle activity. Try our Buddha Purnima Anagram Puzzle and if you like solving it, click here for sure to share it with your friends. May this Buddha Purnima pass well for yourself and your loved ones! 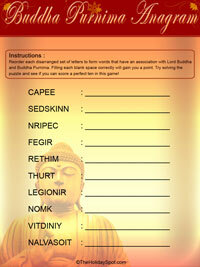 Try this awesome Buddha Purnima anagram puzzle and usher in a happy festive time. 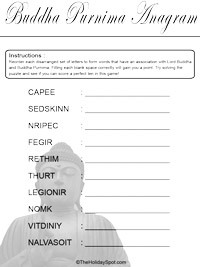 Just follow the printing directions, take out a print of the puzzle template given below, use the word clues and unscramble the jumbled words to form words that have a connection with Buddha Purnima's Day. You are sure to enjoy this Buddha Purnima Anagram Puzzle! Click on the anagram template to open it in a new window. Click on the "Print" button in the new window or click File>Print in the top left part of the menu bar of the window. To preview your printout, click on File>Print Preview before you issue a print. Print out the template. Close the template window to come back to this screen. TIP: Set page margins to zero if you face difficulties fitting the template on one page (FILE, PAGE SETUP or FILE, PRINTER SETUP in most browsers).